Delsea's Aidan Borguet ran for a school record 2,208 yards last season. Delsea High School's Aidan Borguet runs with remarkable speed, strength and vision. That sight extends beyond the football field, too. That's one reason Borguet made a "40-year decision, not a four-year decision," in opting to attend Harvard University and play football for the Crimson of the Ivy League. "I went up there for their spring game and I thought it was going to be a bunch of nerds playing football," Borguet said. "It was insane. It looked like a real college football team. It opened my eyes." Borguet sees other things as well. He knows he has to do more this season than power through some defenders and run away from others. He also needs to avoid his sneakiest foe: the complacency that can creep up on a senior who has made a college decision after a record-setting junior season. "I take that to heart," Borguet said. "Coach [Sal Marchese Jr.] has the phrase, 'Conquer every practice.' That's what I'm trying to do. I want to get better every practice, every week, every game. "I'm doing everything I can, every single day, to be the best player I can be and help my team win." Delsea senior running back Aidan Borguet is a Harvard recruit. Borguet is coming off the best season ever by a Delsea running back, which is saying something given the rich history of the Crusaders' program. 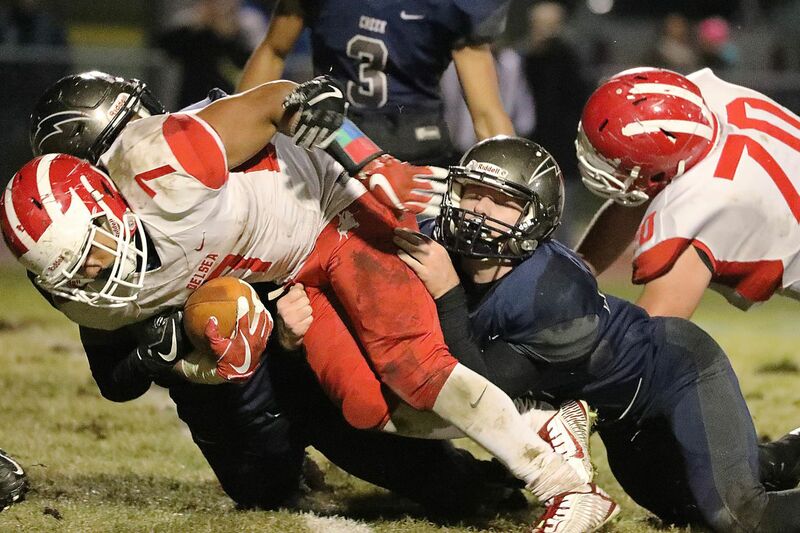 The 5-foot-10, 185-pound Borguet ran for 2,208 yards and scored 31 touchdowns as Delsea won its fifth South Jersey Group 3 title in the last six years. For an encore, Borguet plans to be better in the backfield, more involved with the defense, and hungrier than ever. "I always play with a chip on my shoulder – that changes not at all," Borguet said. "The mindset always is forward. Last year is last year. I'm looking forward to bigger things." Marchese said Borguet's work ethic and leadership are more impressive than his physical ability. "He's fast, he's powerful and he's very elusive," Marchese said. "Plus, he's a very, very smart football player. But the thing about Aidan is how hard he works and that he's such a great kid and a great teammate. "You put all that together and that's what you've got." Senior lineman Colin Poisker, who has been blocking for Borguet since the sixth grade, said his friend spends more time at the high school than at home. "I always kid around and say if you checked his iPhone, his location would show that Delsea is his home and his home is where he visits sometimes," Poisker said. "He's always here. He's always working to get better. He's always been that way." Marchese said Borguet, who played mostly defense as a sophomore and strictly offense as a junior, likely will go both ways for long stretches this season. "I'm looking forward to it," said Borguet, a top tackler as a linebacker and defensive back. "I'm in better shape now than I was last year. My conditioning is at a new level." Borguet was at his best in big games last season. He set a single-game school record with 366 yards in a loss to Timber Creek in the opener. He ran for 207 yards in a regular-season game against Woodrow Wilson. He ran for 230 in a playoff win against Ocean City and for 223 yards with two rushing touchdowns and a touchdown reception in a stunning win over Timber Creek in the sectional semifinals. Delsea has been a run-oriented powerhouse since the school opened in 1960. In 25 seasons under Marchese, who has 200 career wins, the Crusaders have hugged the ground and produced backs such as Sean McPherson, Assad Hafiz, Randy Swanson and Austin Medley, among others. By the time Borguet powered over the goal line for the winning touchdown in the sectional finals last December against Woodrow Wilson, he had outrun all of them. "Now being proven, it takes a little weight off your shoulders," Borguet said. "But my focus always is to be the best leader I can be, the best teammate I can be and to help our team win another championship." E.J. Bard, Cherokee junior: He was a second-team, all-American Division selection as a sophomore. Keevon Berry, Oakcrest senior: He was a second-team, all-Independence Division choice as a junior. Aidan Borguet, Delsea senior: The Harvard recruit ran for a school-record 2,208 yards last season. St. Joseph’s Jada Byers returned four punts for TDs as a sophomore. Jada Byers, St. Joseph junior: He rushed for 1,554 yards and 20 TDs and also returned four punts for TDs. Eli'jah Gray, Holy Spirit junior: He ran for 1,624 yards and 22 TDs last season. Xavier Coleman, Lenape sophomore: He is one of South Jersey's top young running backs. Isom Golden, Glassboro senior: He flashed great potential as a freshman but has been slowed the last two seasons by injuries. Dashaun Harris, Gloucester Catholic junior: He ran for 1,050 yards and 14 TDs as a sophomore. Michael Jenkins, Collingswood senior: He ran for 617 yards and 8 TDs in just five games last season. Kenny Lim, West Deptford senior: The Princeton recruit ran for 1,055 yards and 13 TDs. Johnny Martin, Highland sophomore: He has offers from Baylor, Temple and Syracuse. Muheem McCargo, Woodrow Wilson junior: He ran for 1,045 yards and 11 TDs as a sophomore. Rashad Raymond, Cinnaminson senior: He ran for 1,351 yards and 15 TDs. True Robinson, St. Augustine senior: He's a workhorse back who should flourish in the Hermits' physical style. Pennsauken’s Nahzir Russell ran for 1,405 yards and 19 TDs as a junior. Nahzir Russell, Pennsauken senior: He ran for 1,405 yards and 19 TDs. Eric Staton, Triton senior: He ran for 561 yards and 5 TDs with zero fumbles as a junior. Mohammed Toure, Pleasantville senior: He ran for 909 yards and 9 TDs and also is a highly recruited linebacker. Bhayshul Tuten, Paulsboro sophomore: He projects as the Red Raiders' next great ball-carrier.